It's no secret that we adore cooking, we love being in the kitchen whipping up our favourite recipes. However, we have to admit that it's rare we stray from the family cookbook, which isn't really a cookbook and more of a do what you've seen Nanna and Grandad do kind of thing. With Blue Apron you are able to choose your plan, be it a family plan or a two person plan. You can tailor your menu to suit what you like, flavors, tastes, allergies and you can even see what the menu for the week ahead is going to be. All ingredients are then prepped and portioned and sent right to your door. All their food is farm fresh, their seafood from sustainable fisheries and their meats and poultry have no added hormones. We really love this about them, you couldn't wipe the smiles from our faces when we opened our box to see such yummy goodness. You get these awesome sheets that give you step by step instructions as to what you do and what you will need to get from your box for each meal. We love that these sheets include pictures. We are not ones for recipes books without pictures. We love seeing what the end result should look like, as well as actually being able to visualize what we need to do. All ingredients are labeled, making it incredibly simple to follow, prep and not leave anything out. No forgetting anything at the store or realizing you totally don't have the right seasoning required, it's all right in front of you. Voila! It was a real treat following the recipe sheet, mixing new ingredients together and playing around with flavours that Kelly and I don't use on a day to day basis. It was nice to not have to think about what to make or wonder if certain seasoning's blend well with others. We learnt a lot and mmmm, this taste so good. The cod was so fresh and the capers and mayonnaise dressing was scrumptious. This was honestly so delicious. We love capers and used to eat them all the time when we were little, but if we buy jars now we never end up using them and they get lost in the back of the fridge. Endive is something Nanna always has in and cooks with most meals, it is super tasty but we never think to reach for it when we are at the store. The fact that this recipe was all planned out and we had everything we needed made cooking a new dish so much fun and allowed us to experiment with all these yummy ingredients we never really have in. In addition, the portions were perfect and there was no waste. 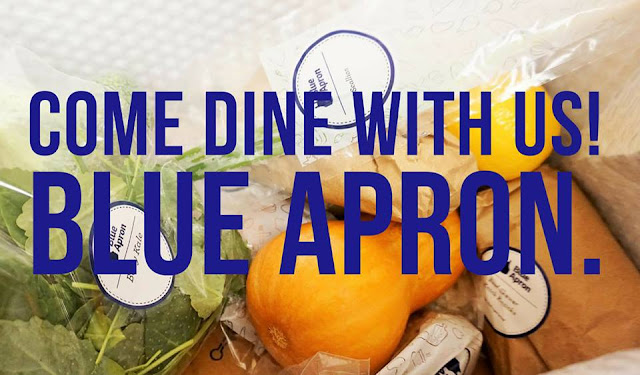 We couldn't be more delighted with our Blue Apron box and are so happy to be able to share with you our special link where you get the chance to try it out for yourself too. Simply follow the link and you will be able to receive three FREE meals. Yes, THREE FREE meals. We highly recommend giving it a go. We already can't wait for tomorrow's dinner...no grocery trip needed or running around hunting for ingredients, it's all in the fridge and ready to go. Stay tuned. *Just a little note, Blue Apron is US only.